When I studied abroad in Florence, Italy in college, one of my last trips was to Budapest, Hungary, where I spent a long weekend with my college roommate, Alex, and her family after she came to visit me from the States. However, after a few months of traveling to six other countries and 15 Italian cities, I was feeling tired and a bit homesick. So, when Alex and I trekked to Budapest, we spent more time than we probably should have hanging out in our beautiful hotel room at the Marriott (I was used to questionable hostels and bunk beds), eating American food as we celebrated Thanksgiving and taking dopey pictures that only best friends take. Me at our hotel, Danubius Spa in Budapest. So, six years later, I was psyched to head back to Budapest with Mike for our 9-day tour with Gate 1 Travel to the Hungarian city, Vienna, Bratislava and Prague. 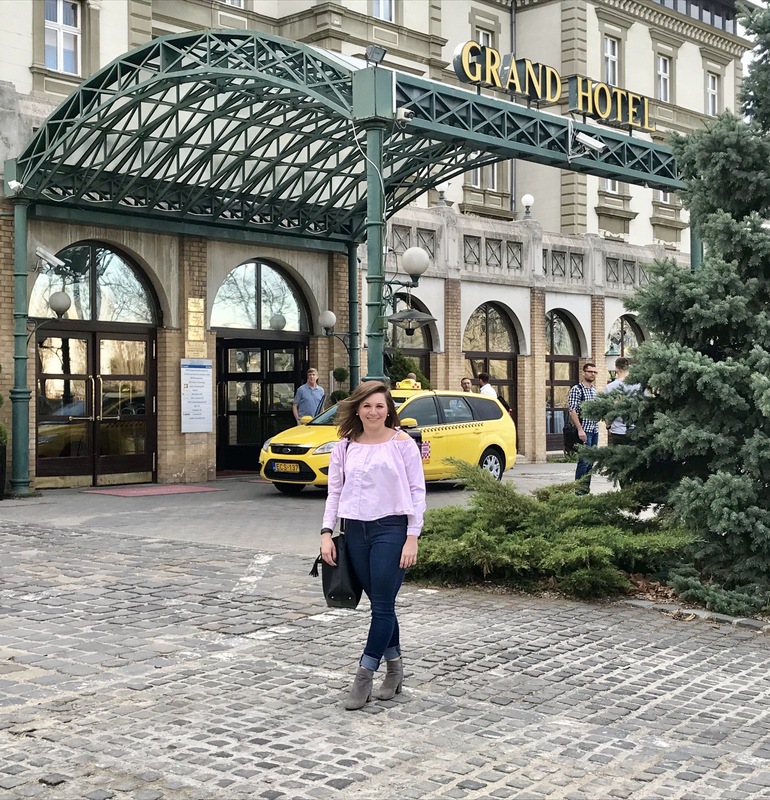 I hadn’t been to any of the other cities like I had to Budapest, but I was ready to see what I had missed out on as Alex and I had lounged in our hotel room. Having not slept much on the previous day’s eight-hour plane ride, four-hour layover in Zurich and hour-and-a-half flight to Budapest, nor during the night at the Danubius Health Spa Resort on Margaret Island as we struggled from jet lag, Mike and I are no doubt exhausted but ready to hit the ground. I remember from our tour to Thailand last year and my many previous) journeys that these kind of trips are not for relaxing. We will probably never come back here in our lives (there are so many more new places to see!) so it’s important to make the most out of every moment, tired and hungry or not. 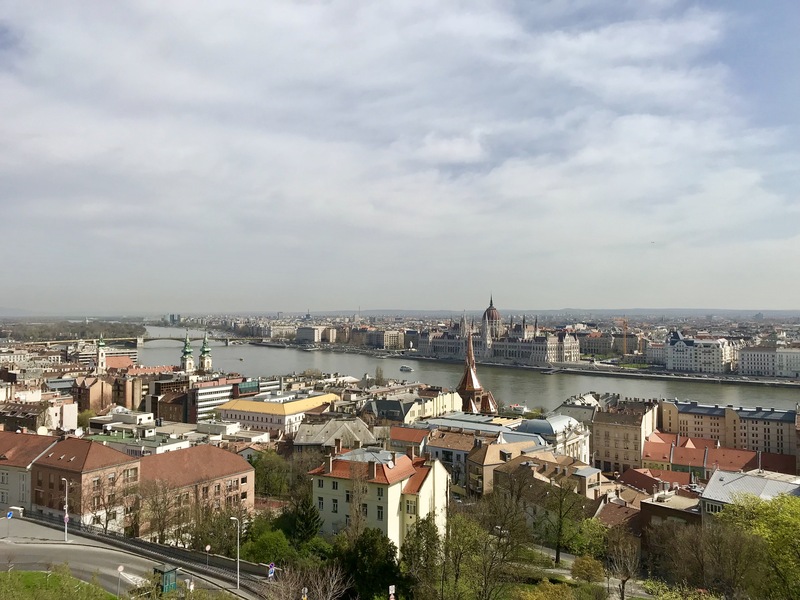 Our day starts out with a city tour of the Parliament, the Royal Palace, Heroes Square, the Matthias Coronation Church and a view from Fisherman’s Bastion, a great way to get reacquainted with the city before we have the afternoon to explore. Wandering through the streets and listening to our tour guide, Melinda, I realize that I do vaguely remember much of these highlights from my time with Alex, so maybe we didn’t do such a crappy job that I’ve always thought. The view of Budapest from Fisherman’s Bastion. Budapest is truly the underdog of Europe. Having been bombed many times over throughout wartime, many of the buildings are only about 100 years old, since not much remained from before World War II as it was defeated and taken over many times. As Melinda says, “The joke goes that if you want to win the war, pick the side that Hungary isn’t on.” It’s very sad for a city that is known, as rightfully so, as the “Paris of the East,” with its beautiful buildings and Danube River, which separates the former standalone cities of Buda and Pest. At the end of the city tour, Mike and I go off on our own, checking out a small local market and eating amazing goose liver sausage and enjoying some Hungarian beers before going to the House of Terror, a museum that was formerly the headquarters of the city’s Secret Police and homage to the terror they yielded during the days of communism and fascism. 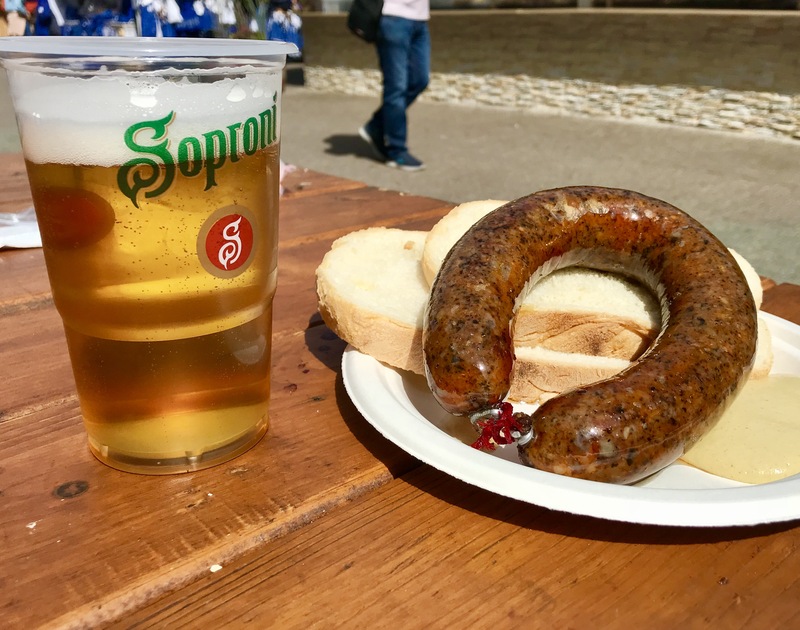 Goose liver sausage from an outdoor market in Budapest. Although the museum feels a little inaccessible to us since the only English is an informational piece of paper in each room, it’s still interesting to see the video footage from survivors, Nazi tools and uniforms and propaganda posters, as well as the most disturbing part of the museum – the underground cells used to house, torture and kill prisoners, restored to their original barrenness. 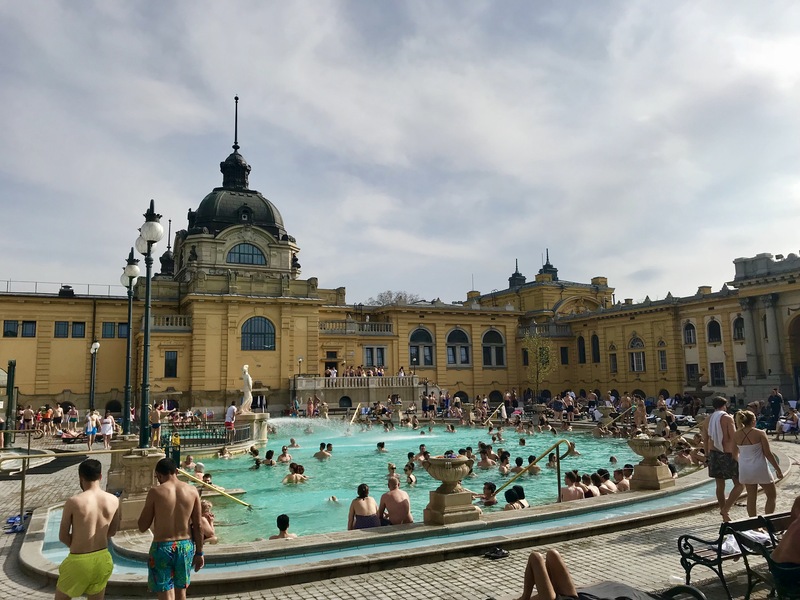 Then, Mike and I hop in a cab and go to the Széchenyi Thermal Bath, the largest thermal bath house in the city. When Alex and I came here six years ago, the place was empty, with only locals using it as it was November and there were no tourists. This time, though, the sun is shining and it’s a beautiful spring day, so the place is mobbed with tourists. However, where else can you take a bath surrounded by this opulent, historic architecture? Széchenyi Thermal Bath in Budapest. 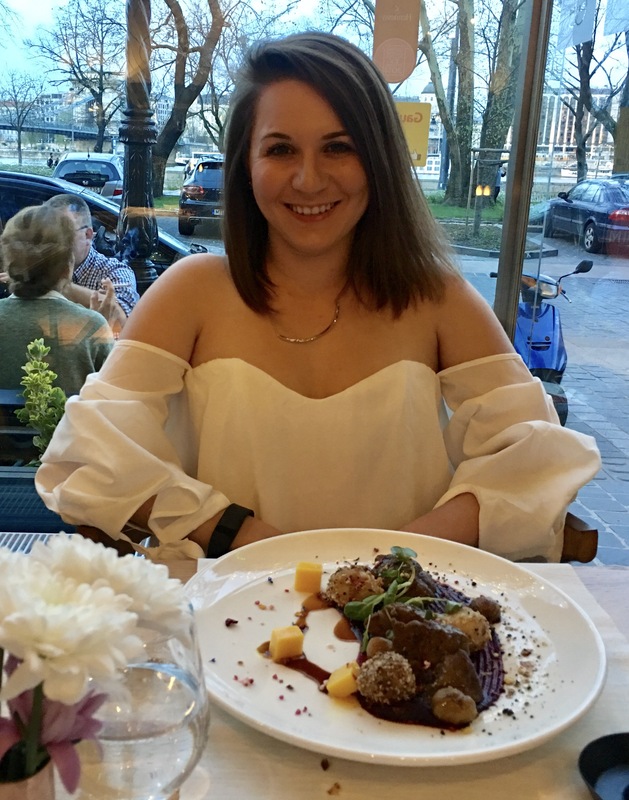 Budapest, unlike New Jersey, has a few Michelin-starred restaurants, so Mike and I make a reservation at one with glowing reviews – Zona, which takes modern twists to Hungarian dishes, like Mike’s order of venison goulash and my wild boar jowl. At the modern and swanky, yet cozy, eatery, we eat these among sardins and smoked duck breast – however to no surprise, we leave not totally full, something to be expected I think at a restaurant of this caliber. The bill, however, comes to only $113 – not bad for two entrees, two appetizers and a bottle of wine. Me at Zona, a Michelin-starred restaurant. 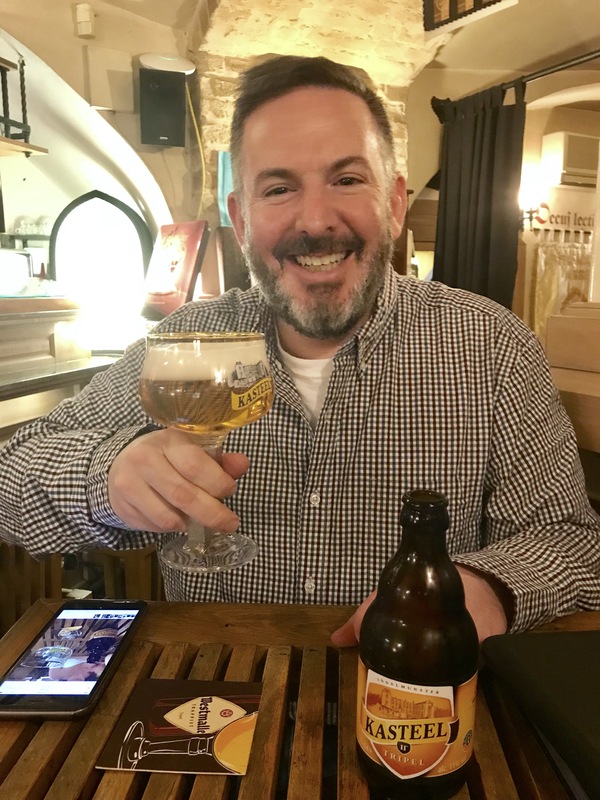 Before calling the cab home back to the island, Mike and I wander down the street into an underground Belgian beer bar, and we choose beers with the help of the Hungarian waitress to eat alongside our pommes frites. That night, I hope to catch up on some sleep (yeah, right) so we can get up bright and early for our tour of Parliament, St. Stephen’s and the Great Market Hall. Mike at a Belgian pub we stopped at on our way back from dinner. That’s true, however where I live in New Jersey, this is what we pay for an average meal!